Rukia died as an infant and was sent to Soul Society with her older sister, Hisana. Though Hisana initially tried to protect and provide for Rukia, she could not ensure her own survival while caring for a baby as well, and thus abandoned Rukia. As Rukia grew up she befriended Renji Abarai, and over the coming years the two stayed together and looked out for one another. Once they entered the Soul Reaper academy, Rukia was adopted into the Kuchiki family. Hisana, having years earlier married into the family and subsequently died of an illness, begged her husband, Byakuya Kuchiki, to find Rukia. Disgusted with herself for abandoning Rukia, Hisana wanted her sister to be part of the Kuchiki family while never knowing of their relation to each other. After succeeding in this task, Byakuya kept his word, treating Rukia as a sister and keeping his wife's secret until the end of the Soul Society arc, where he finally tells Rukia about Hisana's past. When she was accepted into the 13th Division, Rukia's abilities made her a prime candidate for a seated position. Wishing to keep Rukia out of harm's way, Byakuya used his influence as a captain to make her ineligible for such a position.In time, Rukia befriended the lieutenant of her division, Kaien Shiba, and trained under him. During the course of a mission Kaien was possessed by a hollow and Rukia was forced to kill Kaien to protect herself. While dying, Kaien apologized to Rukia for allowing himself to be possessed and thus putting her in that position. Rukia returned his body to his family, though could not find the courage to tell them how he had died until she learned about Hisana. Although there was nothing she could have done to prevent Kaien's death, Rukia continually feels guilty about what happened to him throughout the series. Because she immediately killed Kaien without first trying to find a way to help him, Rukia convinces herself that she valued her own life over his. The only solace she is able to find in his death is the belief that she saved him from a hollow's control. This guilt-ridden attitude carries over to her relationship with Ichigo Kurosaki; when Rukia is taken into custody and Ichigo is gravely wounded in an attempt to save her, she assumes that he dies of his injuries. Feeling that Ichigo's death would have been avoided had she never met him, Rukia loses her reason for living and resigns herself to her sentenced execution. Because of the amount of time she has spent with Ichigo, Rukia has been able to gain a keen understanding of his inner workings. She is as such always able to help him overcome his own self-doubts, showing him that he can and wants to complete a given task when he himself thinks otherwise. Rukia's relationship with Ichigo is unique, for despite the relatively short amount of time they have known each other, Ichigo can easily confide in her and considers her a true friend because she is encouraging and understands what he is feeling. Rukia's ability to get into others' heads comes into play a number of other times throughout the series, most commonly while in the human world. By playing the part of a poor, innocent girl, Rukia is able to get others to side with her and otherwise focus their scrutiny on an unrelated topic so that her peculiar actions might go unnoticed. A recurring gag throughout the series is Rukia's drawing ability, or lack thereof. When needing to explain something to someone, most commonly Ichigo, Rukia uses poorly drawn pictures to illustrate the topic. Regardless of what the subject might be, all of her works most closely resemble bears, rabbits, or some other typical woodland creature. Ichigo is always quick to comment on this deficiency, and promptly receives either a beating and/or graffiti to the face for bringing it up. Rukia's only initial ability are her kidō spells, which she uses for such purposes as restraining, healing, or attacking others. At the start of the series her spells are severely limited, being both weak and of a small variety, due to the bulk of her powers being given to Ichigo. After returning to Soul Society and regaining her Soul Reaper abilities, Rukia is able to cast spells at her previous capacities, such that she can cast multiple spells in quick succession and even use two spells at the same time. Rukia's kidō skills are of great caliber amongst Soul Reapers, and by her own admission her mastery over kidō far surpasses her mastery with a blade. Rukia's zanpakutō, Sode no Shirayuki ("sleeve's white snow"), is released with the command "dance" (mae). In its released state the blade becomes completely white and a ribbon forms from the pommel, earning it the recognition as the most beautiful snow and ice zanpakutō in Soul Society Sode no Shirayuki utilizes ice to attack, each of its three abilities being labeled as "dances" by Rukia. 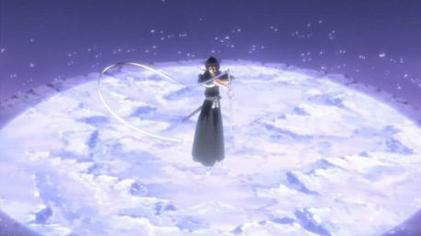 "First dance, white moon" (some no mai, tsukishiro) denotes a circular area around Rukia's target and freezes everything within the circle from the ground upwards until it reaches the sky. "The next dance, white ripple" (tsugi no mai, hakuren) fires a massive wave of ice from Sode no Shirayuki's blade. "Third dance, white sword" ( san no mai, shirafune), her final ability reserved only for when her blade is broken, reforges her zanpakutō with ice particles, piercing through any object in its path and freezing anything in the vicinity. Rukia first meets Ichigo Kurosaki in the midst of a hollow attack. After she is heavily injured by the hollow, Rukia is forced to transfer her Soul Reaper powers to Ichigo so that he can kill the hollow and save their lives and his family. While he succeeds, Rukia is left too weak to return to Soul Society, and lives with Ichigo in the human world, intending to stay until her powers are restored. During her time in the human world, Rukia remains unaccounted for in Soul Society, so Byakuya Kuchiki and Renji Abarai are sent to find her and return her to the Soul Society.They succeed, and upon their return Rukia is sentenced to death for giving her Soul Reaper powers to a human. Ichigo ultimately arrives in Soul Society in time to stop her execution, and tries to get her to safety. During Rukia's bid for freedom, she is stopped by Sōsuke Aizen and his accomplices. Aizen, having singlehandedly orchestrated Rukia's execution, reveals to her that within her soul is stored the Orb of Distortion, a powerful artifact created by Kisuke Urahara which gives hollows Soul Reaper powers and vice versa. Wanting the Orb for himself, Aizen hoped that her death would give him access to it, but settles for a nonfatal alternative. The Orb is removed from her body, Aizen and his men flee Soul Society, and Rukia is acquitted of all charges. With the Orb, Aizen is able to create an army of arrancar, which he uses to attack Ichigo and his friends once they return to the human world. Rukia and a group of other Soul Reapers are sent to assist in fighting the arrancar, though after Aizen captures Orihime Inoue they are recalled to Soul Society. Unwilling to give up Orihime to Aizen, Rukia goes to Hueco Mundo with Ichigo to rescue her.While there, Rukia encounters the 9th Espada, Aaroniero Arruruerie, who soon reveals himself to contain the soul of Kaien Shiba. Saddened that she had not saved her mentor from the control of a hollow as she had previously thought, Rukia kills Aaroniero so that Kaien can finally be free. Rukia is badly injured during the battle, and it is not until Soul Society sends reinforcements to Hueco Mundo that she is revived and her wounds are healed.